Why, one might ask, should we allow our employees to have a voice in the workplace? This is a somewhat straightforward question that has a multitude of answers. Nita Clarke, director of the Involvement and Participation Association and vice-chair of the MacLeod review, adopts the simplistic approach, stating that employee voice is the key to creating and maintaining a successful business . And she certainly has a point. Employee voice, generally speaking, has four main purposes, it: “helps organisations to understand the employee attitudes about work, presents a form of collective organisation to management, influences leaders’ decisions on work-related issues, and shows the reciprocal nature of the employment relationship” . Adopting and promoting a structure, where employee voice is central, allows for a deeper and more meaningful relationship between the employee and the employer, helping to improve and further develop communication. Allowing employees to speak up and have an unrestricted opinion on work affairs, poses an extensive number of benefits not only to the employee but also to the employer. Benefits to the employee From an employee’s point of view, having an assertive voice within the organisation he or she belongs to is most definitely profitable. But why? First and foremost, it increases your value. Voice, according to William Kahn, is “the harnessing of organisation members’ selves to their work roles; in engagement, people employ and express themselves physically, cognitively, and emotionally during role performances” . Voice, after all, characterizes the value an individual brings to a company. If you regularly share the views you have and vocalise your opinions on certain issues, you are more likely to be considered a valuable and worthy part of the team. However, if you are less willing to articulate how you feel and very rarely give useful input or share new ideas, colleagues and more senior members of the company may be more inclined to view you as a replaceable and unimportant component of the team. Having a voice at work ultimately means you have more influence and control over the work you do and the amount of it you are doing, allowing you to better manage your workload. When you freely and regularly express how you feel, it allows you to take control of matters and perhaps carry out a project or piece of work in a manner, which is more to your liking or to a time-scale that suits you better. If you do not let your voice be heard and fail to communicate with your manager or supervisor, then they will not be aware of any problems you may have. If you don’t speak up or voice any concerns or problems, you cannot expect things to improve or be rectified. Additionally, how you express your opinions at work reflects who you are as an individual, and more importantly mirrors the beliefs and morals you hold. For example, if a certain issue goes against the beliefs or values you have, and you speak up and make it known that you disagree, you will come across as a moral and ethical individual who whole heartedly stands by there beliefs. This may even result in other employees respecting you more, not only for speaking up about your dissatisfaction over work issues, but also for holding such commendable and creditable morals. These days’ people are keeping their heads down and staying quiet as a means of avoiding confrontation and keeping favour with their boss. Many are under the impression that it is out with their role to challenge other employees or introduce new ideas. Often, employees would rather “suffer in silence” , as they believe they will be more likely to advance in the workplace, be offered promotions, and in turn, get more responsibilities. However, it is quite the opposite. Individuals who are more outspoken often have a more dominant and presidential role within the company. Those who are not afraid to speak their mind are often tasked with taking meetings and managing a larger group of employees, showing that it pays to have a voice within an organisation. By speaking up and having a voice, an employee can learn a lot about where their strengths and weaknesses lie. If they can identify a weakness and feel comfortable enough to address it with their line manager or that alike, the area of weakness can be evaluated and hopefully improved, resulting in the employee feeling happier and more comfortable with a certain area within their line of work. Similarly, they can also establish what they are best at, allowing them to hone in on that skill and focus more on that area of their job. When an individual feels as if they can be themselves and openly voice how they feel at any given time, they understandably begin to enjoy their role more and start to truly appreciate the colleagues they are surrounded by. In a recent study carried out by Blessing White, 38% of engaged employees stated the reason they stay with the company is due to job satisfaction and fully enjoying the job they are doing. When you feel as if you cannot truly address issues and problems you inevitably begin to become stressed. Giving employees a voice therefore reduces stress levels and takes a huge weight off their shoulders, allowing them to appreciate their work more and subsequently, increase their productivity. Allowing employees to make themselves’ heard in the workplace presents a whole number of advantages to the employers, also. The organisation as a whole suffers when employees are not involved in decision-making and cannot have a say in company affairs. Productivity and performance becomes increasingly worse and employees begin to lose motivation and become disgruntled when they feel as if they cannot speak about how they truly feel or address any on-going issues or problems. By allowing employees to have a voice, individuals begin to flourish in their working environment and feel more comfortable and confident when it comes to sharing ideas, giving feedback and input, and having group discussions. Furthermore, there is a boost in motivation when employees have a voice, as they believe they have contributed to the overall outcome or the decision that has been made, making them feel valuable and an integral part of the team. 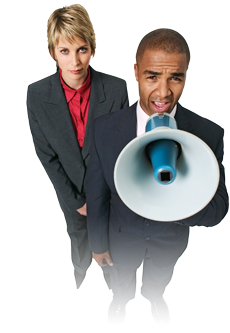 Employee voice results in a reduction in conflict. When an employee can exchange new ideas and openly speak their mind, there is an increase in co-operation and thus, an improvement in the relationship between the employer and the employee. As reported by Dale Carnegie, 80% of employees dissatisfied with their direct manager were disengaged. These statistics prove that by having a more relaxed and open approach in the company, employees are more likely to feel engaged and will not feel as if they are being dictated to or controlled by other members of staff. 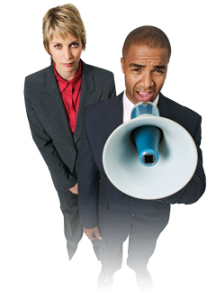 So promoting employee voice is favourable, but is it really a necessity in the working environment? There are two sides to this coin. On one hand, employee voice makes relatively no difference. On the other, it is extremely detrimental to the way the organisation is run and the success it can have. So which is correct? Essentially, the evidence doesn’t lie. Well-researched statistics and figures show that implementing a structure, which allows employees to have an active role and play a vital part in the way a business is ran, is profitable to everyone. However, it is no good just promoting this kind of structure. It needs to be implemented and religiously followed, continuously allowing for employee voice to be heard. After all, if no one spoke up and had their say, where would we be? Continue the discussion and let us know what you think via Twitter or LinkedIn. Drum roll please. Grow3 starts blogging! Welcome to the Grow3 blog! Allow me to give you a quick summary of our team, what to expect from our blog and a bit about my personal experience of working at Grow3. Although in the world of business we have been around for some time now, (25 years to be precise), the world of blogging and social media is a new platform we plan to conquer. So we want to hear from you through social media. Join the online discussion and help us grow, and in turn, we help your business grow. When I started working at Grow3, it took me a while to truly get into the gist of our services. I had to understand the meaning of terms such as engagement services, sustainable development, business strategy, growth and market insight. But the amazing team at Grow3 helped me truly understand how crucial each function is. Before joining the Grow3 team I studied Journalism and Applied Economy and worked as a Marketing Consultant for a Web Design Company. Marketing was always my passion; it is the perfect combination of creativity and communication. Working at Grow3 has given me the opportunity to apply all my skills and gain lots of hands-on experience. Our team is very unique in the way that we all provide such a vast set of skills and experience. We have a variety of nationalities and languages circulating the office, which is very advantageous. We work with people from all departments such as: marketing, media and journalism, management, finance, IT and many others. Our multicultural team includes individuals from: Denmark, Belgium, Netherlands, Italy, Spain, France, Poland, Czech Republic, Belarus, Ireland, Scotland, Texas, Colombia, Venezuela, Ghana, Ivory Coast, Sudan, Bangladesh and China. This variation enriches us not only on a cultural level but it helps us to achieve new levels of creativity through ideation. People from different parts of the world have various ways of thinking, so we can empathise with your needs and we can see things from multiple angles. 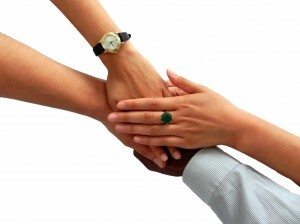 In our next blog post we will be discussing employee engagement. It will focus around allowing employees to have a voice in the workplace. You can look forward to new posts every Wednesday. Our articles will give you an intelligent perspective on engagement, market research or ethical leadership. We will feature interviews with successful entrepreneurs from the business world and they will share their story and their experience of business growth. Exciting stuff! So watch this space, we promise it’ll be worth it. Please feel free to comment, share opinions or tell us your post requests. We look forward to starting a discussion with you. If we can give you a hand with any aspect of business growth, feel free to contact us!